Leave the motorway at Junction 16 and join the A500 towards Stoke on Trent, (eastward). 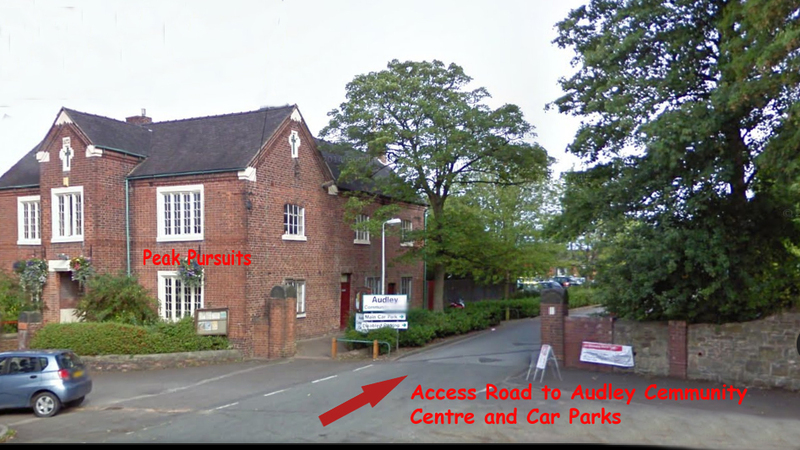 Take the next Junction, signposted Alsager and Audley, and at the end of the ramp turn right onto Audley Road. After almost 1 mile a mini roundabout is reached, turn left, up the hill to Audley. At the top of the hill, the Peak Pursuits office will be on your left, turn left into the car park located outside the Centre. Follow the A34 northwards, after the Lymedale Business Park junction, take the next left, signposted A5500 Chesterton. Keep on the A5500 through Chesterton, to Bignall End village, again keep on the A5500, about half a mile, until Audley is reached via a steep hill. At the top, Peak Pursuits is on your right, just after a pelican crossing, turn right into the car park located outside the Centre.